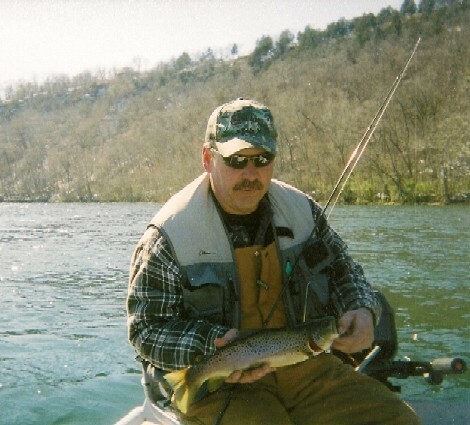 Owner/Guide Duane Bell was born in Denver, Colorado. Father, Jerry and Uncle Charles Grimes fished mountain streams and introduced Duane to his first rainbow trout at the early age of 4. In1963 the family moved to Missouri. Farm pond bass and catfish were the fishing fix with a few visits to Colorado scattered about. In the 1970's Duane's Dad discovered Lake Taneycomo and trout fishing was on again. Duane began to hone his trout skills and the passion began. In 1999 on a sightseeing drive with wife, Rhonda, the White River was discovered. That was it. They sold their auto repair shop and home and built Cedar Springs Country Inn and CSCI Troutfitters in 2003. Duane and Rhonda invite you to experience fishing the famous White River and the splendor of the Ozarks first hand. CSCI Troutfitters offers full and half day trips, fly or spin cast, 365 days a year. All tackle, bait and equipment are furnished on spin cast trips but feel free to bring your favorite spoons or lures. Fly fishermen need to bring fly rod, waders and favorite flys. Hot flies are available if needed.